Milk and Dairy Products - Are They Safe for Your Dog? So, what exactly is lactose? Well, lactose is a kind of sugar. Not just one single sugar, but two sugar molecules chemically linked together. In order for a dog to digest milk, the lactose must first be broken apart into its two basic, easy-to-absorb sugars. And in order to do that, a dog’s body must be able to produce a special lactose-splitting enzyme known as lactase. And that’s one thing most dogs can’t reliably do. 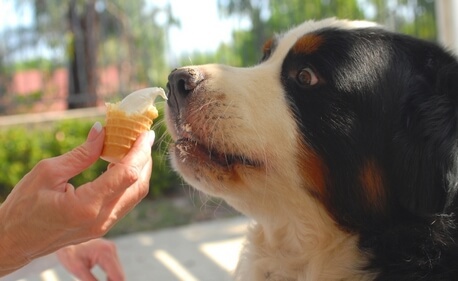 Without lactase, a dog simply cannot digest dairy products. And acute intestinal symptoms nearly always arise. Now, this inability to digest milk is infamously known as lactose intolerance. And it’s the same lactose intolerance so many humans suffer from every day. So, if you’ve ever noticed your dog tends to develop gas or loose stools after having milk, there’s a good chance your pet may be suffering from this condition. Now to be fair, and in rare cases, a dog can be allergic to the protein in milk1. However, milk shouldn’t be considered toxic for a dog. Yet for dogs that are lactose intolerant (as so many actually are), dairy products can present a real problem. Yet for those pets, there’s still hope. That’s because a dog’s reaction to lactose can be directly related to the “dose”. The higher the lactose content, the greater the likely response. Thankfully, not all dairy products contain the same amount of lactose. Many kinds of cheese and yogurt contain considerably less lactose than milk. Take a look at this table. Notice how some milk products contain only a minimal amount of lactose per serving. 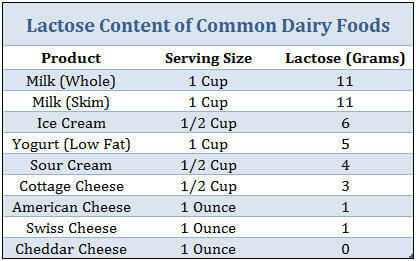 For example, notice how most cheeses contain very little lactose. About a gram per serving. Sometimes less. Now, compare that quantity to whole milk, which clocks in at a whopping 11 grams. So, depending on the food, it may be OK to offer low-lactose dairy products to your dog. In fact, almost any cheese can make a great natural treat for any pet.